Has Trump Violated Federal Law? Steve Malzberg with NewsMax recently interviewed Ben Carson, and the good doctor let something slip. Hear the interview here. DR. BEN CARSON: I do believe, and certainly in my discussions with Donald Trump, he does love America and he does want to be successful. And, he will surround himself with very good people. 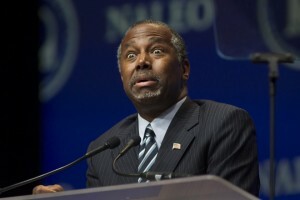 NEWSMAX’S STEVE MALZBERG: And will one of them be Dr. Ben Carson? CARESON: I will be doing things as well, yeah. MALZBERG: That’s been determined? You’ve, when you sat down with him that was discussed? This is where the proverbial screeching brakes sound should be hitting your mind, and audio double-take of sorts. Did he say what I think I just heard him say? Surely not. Carson was clear that he had a preference to support other candidates, though he didn’t say who. He was himself a candidate. Instead, he throws his endorsement to Donald Trump. For endorsing Trump, Carson will receive at minimum a position with Trump’s possible administration in an “advisory capacity” or perhaps an appointed position. The Department of Justice should launch an immediate investigation into the possibly willful violation of 18 U.S. Code § 599 by Donald Trump. One must wonder if there is perhaps an intentional strategy here. Carson certainly didn’t sound like an ecstatic Trump supporter in this interview. He sounded plainly burdened and seemed to in tone and words to some extent, calling Trump a “showman”, join the chorus of other GOP candidates. Carson committed no crime as the person offered the position, if an investigation yields such was done. Is there an intent to topple Trump? It’s a bit too conspiratorial for the rational mind, but the GOP has been anything but rational in the past year.